The Democratic Convention was full of delegates, activists and lobbyists, all working towards the election of their candidate and to raise the profile of the issues they care about most. When thinking about the various powerful issue groups or lobbies, there's a good chance you wouldn't quickly think about the demographic of those with disabilities as one of the most visible interest groups at a convention. The fact that disability rights issues is not often high on any agenda, despite that 54 million Americans live with some form of disability, is why Disaboom, an "online community for people touched by disability" sought to raise the community's profile at this year's DNC. 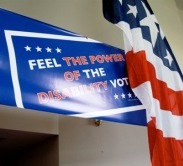 While blogging at the Big Tent in Denver, I met a man who told me about the various events Disaboom was holding at the convention, and a new poll they just released on who those in the Disability Rights community support for president. All of these events came together under the title "Unheard Voice," and saw that the issue of disability rights didn't get left behind in the political conversation. I told the Disaboom contact about the work of the National Campaign to Restore Civil Rights, and he sent along some info about the presence of the Disability Rights community at the convention. "The question of how different minority groups will vote has been a major point of interest in this election and the disability community hasn't been included in the conversation," said Dr. Glen House, founder of Disaboom and a quadriplegic himself. "Disaboom conducted this survey to gauge the political inclinations of the largest minority group in the U.S. -- the 54 million Americans who live with some form of disability...People with disabilities represent 15 percent of the U.S. population, 37 million of us are registered voters, and politically, our voices haven't been heard -- we are the unheard voice of this nation,"
According to Disaboom's poll, 57 percent of respondents support Barack Obama, 27 percent support John McCain, and 16 percent do not support either candidate. With the community rallied around Obama, it made sense that their presence was so strong and diverse at the convention. Of all the issue-area focused groups I saw in Denver, I have to say that Disaboom's work to raise the visibility of those with a disability was particularly strong. Disaboom was liveblogging the event, and in the blogging base of the DNC, The Big Tent, Disaboom also partnered with The Unseen Been Coffee Company, a company founded and run by Gerry Leary, a master roaster who is blind, to keep fueled the many bloggers who were working around the clock. I can personally attest to the fabulousness of their coffee. Along with several other events, PHAMALY, a theater troupe run by those with various disabilities, presented a drama "about inclusion (that) opens up new perspectives on disability and catalyzes a new conversation about the democratic ensemble and (their) role in it." In addition to the work of Disability Rights groups visiting Denver, the city hosted and Accessible Denver Committee, a partnership of concerned Denver citizens and city personnel, both with and without disabilities, to help ensure a hassle-free and enjoyable stay for Democratic National Convention visitors. Their site provided information about Denver-area hospitals, pharmacies, and medical/adaptive supplies sources; dialysis centers; emergency services locations; mental health centers; and nursing services. For more information on the role of Disability Rights groups at the DNC, check out the below links. And keep watch on NCRCR's blog for future guest blogging posts from the cadre of Disaboom's political bloggers.